I walk past this poster by Karl Bickel almost every day. One day, to my surprise, I noticed that the artist's signature looked a lot like the Bluetooth logo. A quick side-by-side comparison of the tiny blue logo on my cell-phone and the poster confirmed the match. I also found this example of Karl's signature (it is in the center of the image). 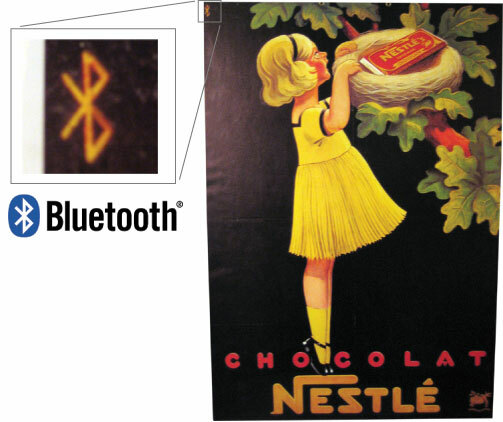 A little bit of internet research revealed that the Bluetooth logo was supposedly constructed from Nordic runes that represent the initials of the Danish king Harald Blåtand after whom Bluetooth was named (see this wiki article). Anyway, I found no mention of any connection between Bickel's signature and the Bluetooth logo on the internet. Has anyone noticed this before?